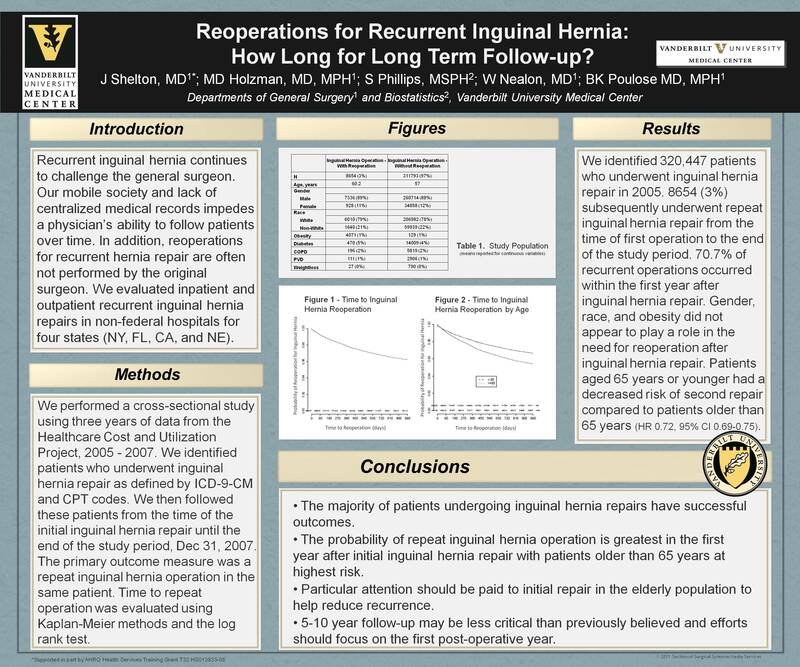 Reoperations for Recurrent Inguinal Hernia: How Long for Long Term Follow Up? Background: Recurrent inguinal hernia continues to challenge the general surgeon. Our mobile society and lack of centralized medical records impede physicians’ ability to follow patients long term. Additionally, recurrent operations are often not performed by the original surgeon. We evaluated inpatient and outpatient recurrent inguinal hernia repairs in non-federal hospitals for four states (NY, FL, CA, and NE). Methods: Using data from the Healthcare Cost and Utilization Project, we identified patients who underwent inguinal hernia repair and followed these patients in time from 2005-2007. The primary outcome measure was a repeat operation in the same patient. Time to repeat operation was evaluated using Kaplan-Meier methods and the log rank test. Results: We identified a population of 320,447 patients who underwent inguinal hernia repair in 2005. 3% subsequently underwent repeat operation during the 3 year follow up period. 70.7% of recurrent operations occurred within the first year after initial repair. Gender, race, and obesity did not appear to play a role in the need for reoperation after inguinal hernia repair. Those aged 65 years or younger had a decreased risk of second repair compared to older patients (HR 0.72, 95%CI 0.69-0.75). Conclusion: The majority of patients undergoing inguinal hernia repair have successful outcomes. The probability of requiring a repeat operation after inguinal hernia repair remains greatest in the first year after initial repair with elderly patients at highest risk. This indicates that 5-10 year follow-up is less critical than previously thought and that efforts should focus on the first post-operative year. Particular attention should be given to geriatric patients undergoing elective inguinal hernia repair to help reduce recurrence.